The challenge with selling a broad portfolio is that customers buy the products in different sales cycles and using different criteria. Customers consider some products low-consideration purchases, so purchase rapidly, and consider other products high-consideration purchases so use a more structured purchase approach. The biggest issue in sales today is using common low-consideration sales tactics for high-consideration deals. 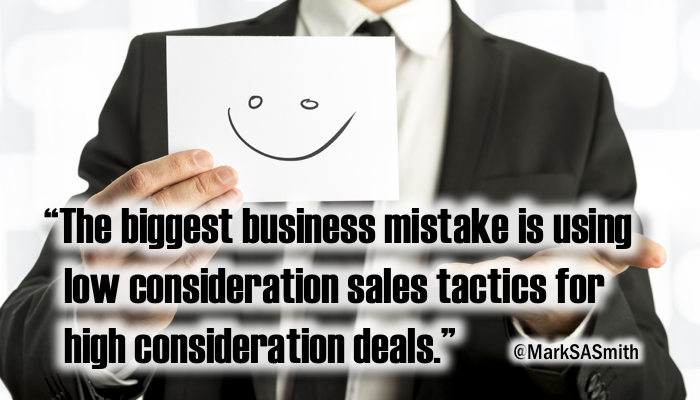 There’s a time for a sales pitch and a time for a consultative approach. There’s a time for self service and a time for full diagnosis. The secret is having a sales team that knows when to do what. Most salespeople go with the pitch regardless of what the customer needs to make a buying decision. Bad choice. 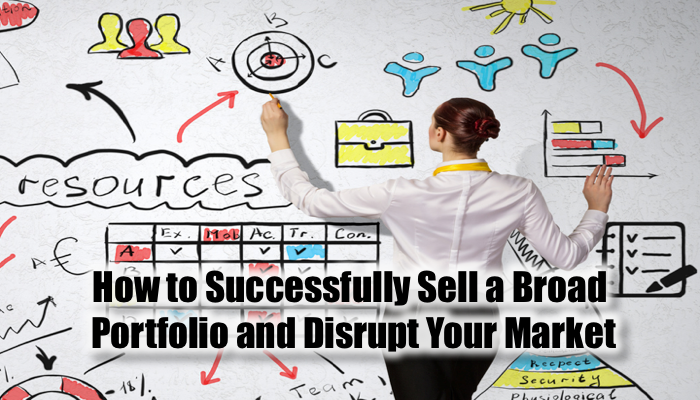 If this resonates with you, read on to discover how to sell a broad portfolio and intentionally disrupt your market. When the same marketing and sales approach gets used for each product in a broad portfolio, everyone gets frustrated. The customer gets to little or too much information. The sales team may expect all products to sell rapidly based on a “good sales presentation” and wonder why some products are so hard to sell. Management can’t understand the inconsistency of sales performance across the team, chalking it up to “good” and “poor” sales skills. And deal forecasting is never accurate until the last minute because the sales team uses flawed prediction models. Recognize this? If you consider the best salesperson in the company, odds are good that they’ve intuitively or intentionally discovered how to best sell a segment of the portfolio and stick to the sales method that works for that product. The worst performing salesperson attempts to use low-consideration sales tactics for high-consideration deals with any success being the occasional blue-bird deal where the customer shows up with an order. Sadly, they chalk up the success to their sales strategy, reinforcing ineffective activity. The good news: it’s likely that the competition faces the same problems. If you can fix the problem with your team, the competition won’t know what hit them. To disrupt the market you must change the sales process, the product positioning, and the customer experience. Understand that different products require a different sales approach depending on the customer: their purchase approval level and how risky they consider the purchase to be. More about this topic here. The more people included in the approval process, the more complex and higher consideration the deal becomes. Choosing the right method speeds the process and matches the level of sales involvement with the customers need for detail and assurance. There are four fundamental product positions: Consumer packaged goods, commercial commodities, lifestyle products, and mission critical products. When you can change the customer’s perceived position of your product from one class to another, you’ll disrupt the market because it changes how customers approach the product purchase. One example is how Apple repositioned cell phones from a consumer packaged good to a lifestyle product, selling at 10 to 100 times more than the competition, disrupting the market. When a customer experience better maps to their purchasing expectations, they change who they consider to be the vendor of choice. Discover what the customers want to experience and deliver that as part of your brand. Before Apple stores opened, customers bought from the wireless carrier store where the focus was on the wireless contract and the device — the customer experience — was an afterthought. Apple changed the experience to focus on how the customer used the device and then selected the wireless contract to fit their lifestyle. They ended up selling every carrier’s contracts and a lot of iPhones. Let’s have a conversation about your experiences and what you want to change about how your team approaches your market. If there’s a fit, we’ll design an approach that matches your culture and develops the right methods for a sustainable, scalable, and profitable operation. Using our insights, your experiences, and market research, we’ll adapt our sales model to select strategies and tactics that your sales team can intuitively use to do the right things at the right time to speed the deal and disrupt your market. Find a mutually agreeable time at MarksSchedule.com or contact me.